News just in from Thierry Voisin of a €40,000 price drop on his listing for sale, the 21.63 metre sailing yacht Aldabra A.
Aldabra A was built in GRP by Finnish yard Nautor’s Swan to a design by German Frers and delivered in 1991 as the yard’s first hull in the ever-popular Swan 86 series. 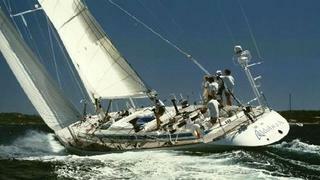 Fast, safe and sea kindly, she won the Maxi Rolex Cup at Porto Cervo in 2000. A fine interior in hand-rubbed satin teak sleeps up to 10 guests in five cabins comprising a master suite and three doubles plus two Pullman berths, making her ideal for use either privately or as a charter yacht. An additional feature is a shallow draft keel of only 3.2m, allowing her access to all those quiet, secluded anchorages. Refitted in 2014, she now has a new generator, electronics system and a hull repaint plus a rebuilt engine. Aldabra A is now down from €690,000 to €650,000.